Adjust oven rack to middle position and heat oven to 300 degrees. Grease 9-inch round cake pan and line with parchment paper. Pulse 1 1/2 cups almonds, flour, salt, baking powder, and baking soda in a food processor until almonds are finely ground, 5 to 10 pulses. Transfer almond mixture to bowl. Process eggs, 1 1/4 cups sugar, 1 tablespoon lemon zest, and almond extract in now-empty processor until very pale yellow, about 2 minutes. With processor running, add melted butter and oil in steady stream, until incorporated. Add almond mixture and pulse to combine, 4 to 5 pulses. Pour batter to prepared pan. Using your fingers, combine remaining 2 tablespoons of sugar and remaining 1/2 teaspoon lemon zest in small bowl until fragrant, 5 to 10 seconds. 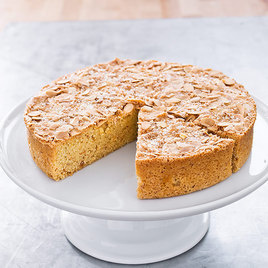 Sprinkle top of cake evenly with remaining 1/3 cup almonds followed by the sugar-zest mixture. Bake until center of cake is set and bounces back when gently pressed and toothpick inserted in center comes out clean, 55 to 60 minutes, rotating the pan after 40 minutes. Let cake cool in pan on wire rack for 15 minutes. Run pairing knife around sides of pan. Invert cake onto greased wire rack, discard parchment, and reinvent cake onto second wire rack. Let cake cool, about 2 hours. Cut into wedges and serve.